A fluffernutter is a sandwich comprised of: two slices of soft white bread, with creamy peanut butter and marshmallow fluff spread on generously. Basically, it is ooey gooey goodness. I honestly didn’t think fluffernutters needed an introduction, but several of my coworkers did not know what they were. I was shocked, because I remember eating them when I was a kid, which is probably why I was am a fat kid… Thanks, mom. The combination of peanut butter and marshmallow fluff is a perfect pairing. I wanted to recreate this nostalgic sandwich in cupcake form. 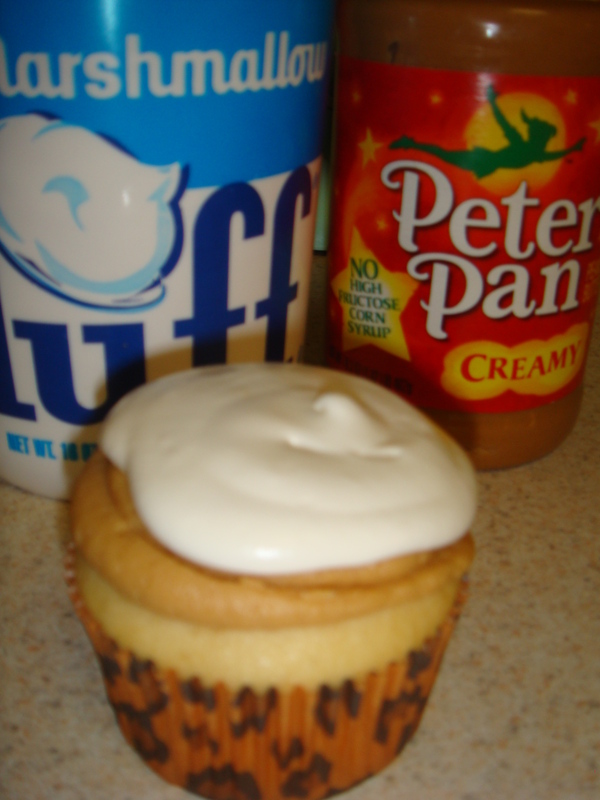 Of course, I could have combined peanut butter into marshmallow fluff frosting, but I really wanted there to be a distinction between the two flavors. Also, I used a boxed white cake, because I wanted a super fluffy soft cake to mimic the iconic white bread used in the sandwich version. 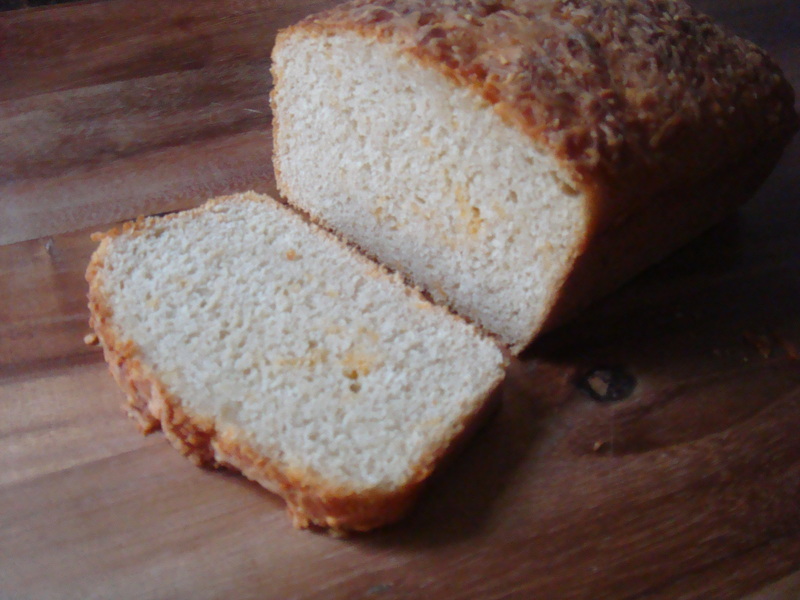 Made from scratch cake has a tendency to be quite dense in comparison to the boxed variety. It’s probably all of those cancer-causing preservatives keeping it fluffy. Beat butter in your stand mixer until creamy. Add marshmallow fluff and vanilla, and beat until incorporated into butter. Slowly (in batches) add powdered sugar, beat until sugar is completely incorporated into the frosting. Beat butter and peanut butter in your stand mixer until incorporated. Slowly (in batches) add powdered sugar, beat until sugar is completely incorporated into the frosting. Add milk, and mix until you get the desired consistency. I wanted to frost the cupcakes using a multi-swirl technique like this: check out this informative blog entry on Good Life Eats. However, I could not find my large star tip, and I was becoming impatient and frustrated trying to find it, so I just layered the two frostings. I actually think it looks kind of cool. I was a baking fool today. 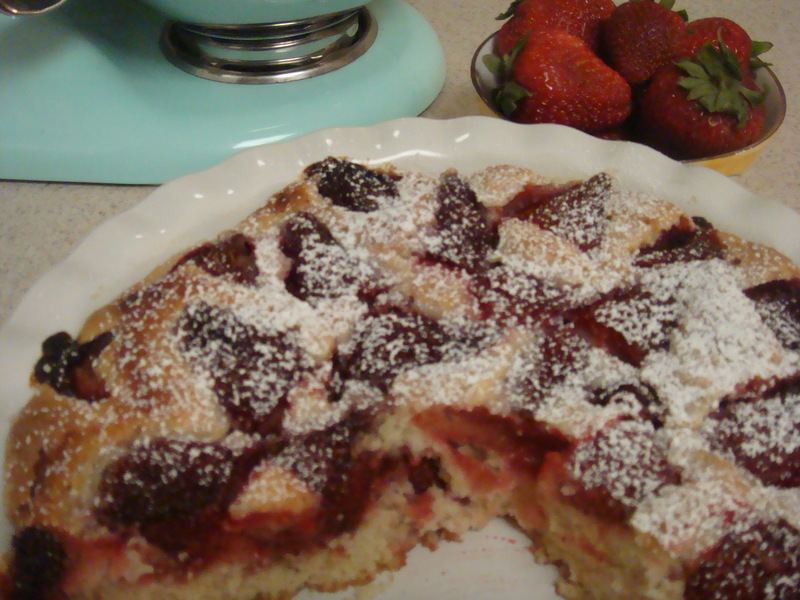 I made an awesome Summer Strawberry Cake and baked a big batch of cookies. My boyfriend takes his lunch to work, so I try to add homemade goodies to his lunch box as often as I can. At the grocery store today, we picked up a big bag of M&M’s that were destined to join a batch of peanut butter cookie dough. 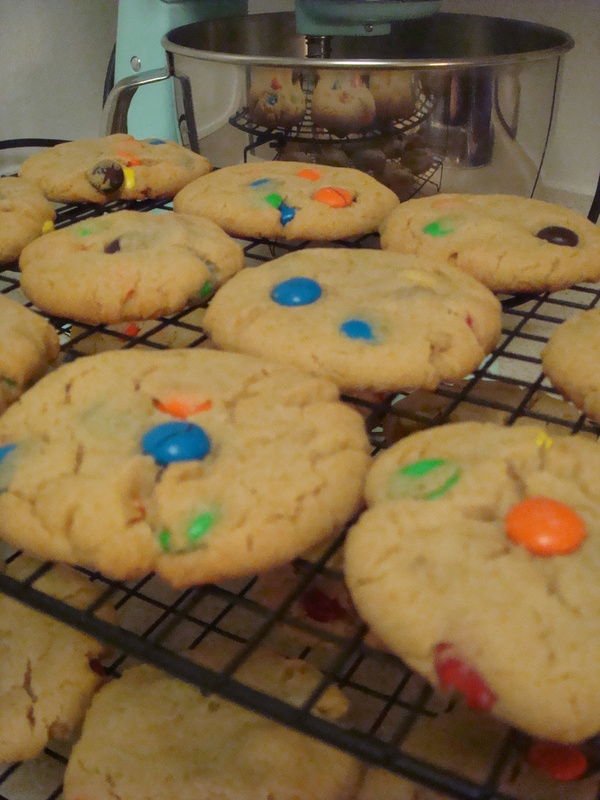 I just adapted a standard peanut butter cookie recipe from allrecipes.com, and added M&M’s. I used Crisco butter flavored shortening, because I had it, and I didn’t have any butter at room temperature when I wanted to make these, but feel free to use butter, or a combination of butter and shortening. Cream together shortening, peanut butter and sugars in your stand mixer. Add eggs and mix until incorporated. In a separate bowl, sift together flour, baking powder, baking soda, and salt. Add flour mixture to the creamed butter in 3 batches. Stir in (by hand) the M&M’s. If you use your mixer to do this, you’ll break up the M&M’s into a hot mess. Roll into 1 inch balls and put on baking sheets. Flatten each ball slightly with the palm of your hand. Bake in a preheated 350 degree oven for about 10 minutes or until cookies begin to brown. Do not over-bake. My cake turned out just like I wanted... which doesn't always happen. When I saw this recipe on Smitten Kitchen, I knew I had to make it. I’m so glad I did. It made my apartment smell amazing, and it was delicious! You can find the recipe here. 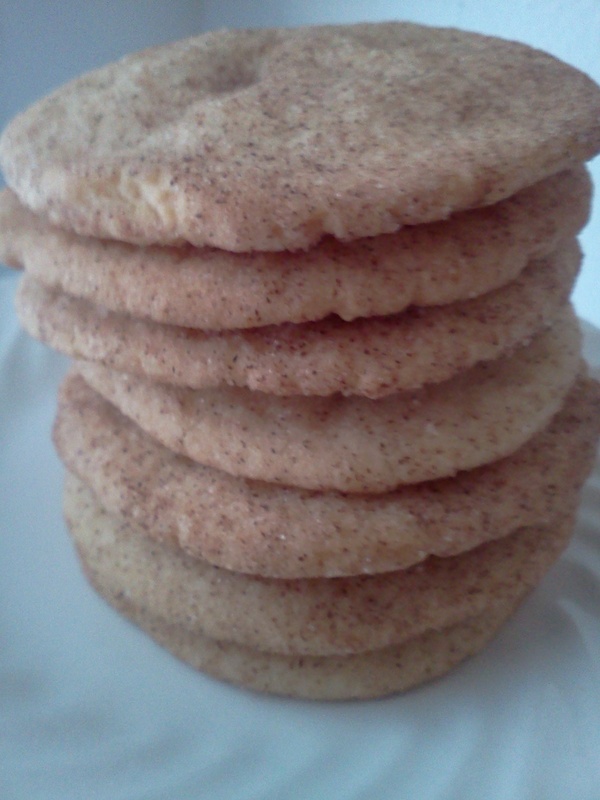 Snickerdoodles = (Sugar cookies + Cinnamon) = Amazing. Yesterday I came across a blog I’ve never read before, and I saw a post for Snickerdoodles, which I LOVE. They’re sooo easy and so delicious. They might even be my favorite cookie of all time. So, why haven’t I baked these in a while? I don’t know, but I knew I had to get on it. I never make them with cream of tartar. I don’t even know why that’s an ingredient in these cookies, but I don’t care. I like my cookies crisp, and this recipe from Martha Stewart delivers. The more you press them down, the crispier they’ll be, if you like a chewier/softer cookie, don’t press them down at all. Preheat the oven to 350 degrees, with one rack in top third and one rack in bottom third of oven. Line baking sheets with Silpat baking mats or parchment paper; set aside. Sift together flour, baking soda, and salt; set aside. In the bowl of an electric mixer fitted with a paddle attachment, combine butter, shortening, and 1 1/2 cups sugar. Beat on medium speed until light and fluffy, about 2 minutes. Scrape down sides of bowl. Add eggs, and beat to combine. Add dry ingredients, and beat to combine. This dessert should come with a disclaimer: Once you make this for family, friends, or co-workers, they will beg you to make it over and over again. Luckily, it’s super-simple to make. My boyfriend is the guy who brings bottled soda or plates to work pot-lucks. While soda and plates are important, I couldn’t believe he wasn’t asking me to make something for him to bring. 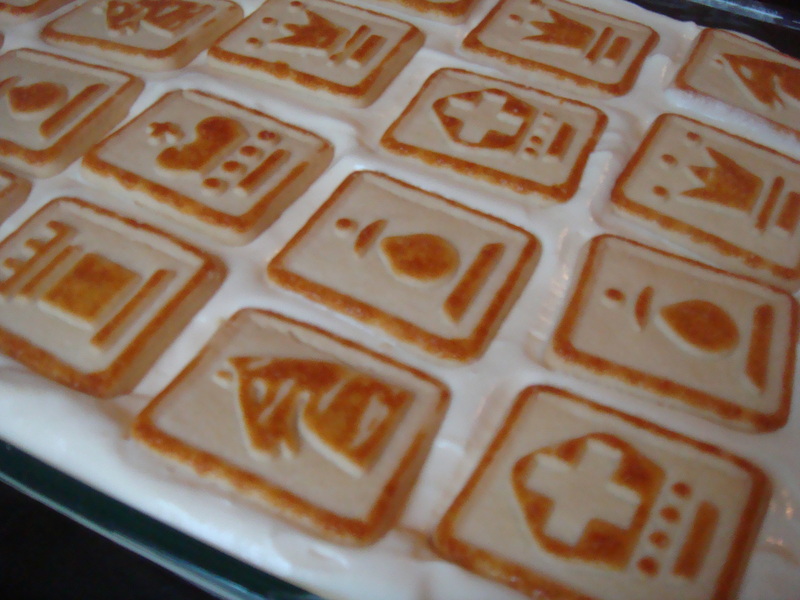 So, a couple of years ago, I sent him with this banana pudding. HUGE MISTAKE. After that, I was making one every couple of months. “I can make other things,” I’d say. “I can give them the recipe,” I’d say. But to no avail… they wanted the pudding. Another possible issue with this recipe is the price of making it. I can sometimes find Chessmen Cookies on sale for 2/$5. Sometimes, I have to pay almost $3 each. When visiting San Diego, I could not find the cookies cheaper than $4 each. So, more than half your cost is in the cookies. But, don’t skimp. While you could find other cookies comparable in taste, the cookies have adorable little Chess pieces on them, which really add to the aesthetic of the dish. While you risk being hounded to make this dessert for every occasion, this is better served at a party or barbeque. You can NOT be trusted with a 13X9 of this banana pudding, if you’re stuck at home alone. Sharing is caring. I found this recipe on My Baking Addiction last September. I’m sure I’ve mentioned her blog a dozen times. It is amazing. Check it out. I made this recipe when I first saw it last year, and we just loved it. You only need one 12 oz beer to make it. However, an extra beer in the fridge isn’t something we normally have (my fault). Last weekend, I made a conscious decision to not drink my last beer so I could make this bread. You can use any beer you want. I used Zeigenbock, but whatever beer you have should be fine. I wanted to bake this weekend… but I ended up not having a lot of spare time. So, I thought I’d still whip something up that’s quick and easy. This recipe is adapted from a Nestle recipe that uses pre-made cookie dough as a crust. I already had graham cracker crumbs, so I used that instead. Though I’m sure these would be amazing with a cookie crust. I wanted to top these with pecans, caramel, and chocolate (think, turtle cheesecake). I made one with the turtle topping, but my boyfriend and I agreed it was too rich. 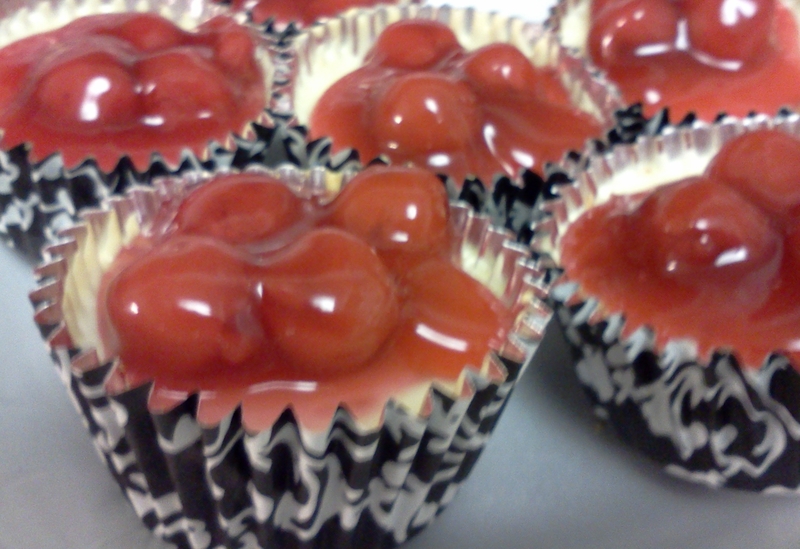 I didn’t want to go to the store tonight, but these definitely needed a sweet/tart topping. So, I headed to the store, sans makeup (eek!) to get cherry pie filling. It was the perfect topping. Preheat oven to 325° F. Line pan with 24 foil muffin cups. Melt butter in a bowl, and then add graham cracker crumbs and sugar. Mix thoroughly. Spoon a teaspoon of the crust mixture in each muffin cup. Press down mixture using your fingers. Bake for 10 minutes. Allow crusts to cool completely. Beat cream cheese, sweetened condensed milk, eggs and vanilla extract in medium bowl until smooth. Pour about 3 tablespoons cream cheese mixture over prepared crusts in muffin liners.